Jeremy Paxman's programme about WW1 uses this photo in the introduction. I hope my research holds up to his scrutiny. I have tried to portray how this devastating conflict impacted on the lives of ordinary, working class people but also how it broke down the barriers between class and gender and changed our world forever. I hope the fact that the BBC has also chosen this image means I got it right. For me, it spoke of the often unknown role of women in that war, who worked as hard as the men they loved and who found strength, companionship and new freedoms, as well as tragedy. 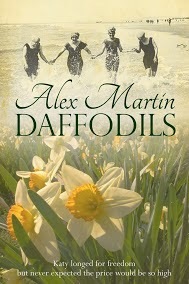 I added Daffodils, instead of poppies, to symbolise the different role that women played to men during the war, but also to indicate that some positive things came out of the sorrow, including new beginnings for society in Britain, especially its women. New cover for The Twisted Vine!